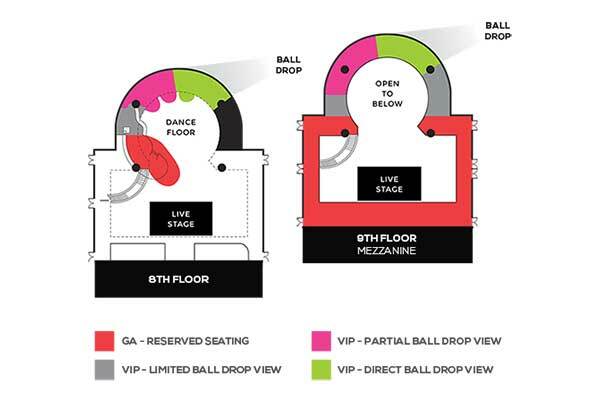 Access to Exclusive VIP Patio during the world-famous Ball Drop at Midnight! Robin Thicke has announced a surprise NYE concert that will take place at the Third Annual Marquis New Year’s Eve, hosted at Marriott Marquis’ penthouse Broadway Lounge courtesy of Matthew Gavin Enterprises. With the ultimate view of New York’s Times Square as this bash’s backdrop, the night is destined to be epic. Aliana Lohan opens for Thicke in a concert littered with celebrity performances that includes Niykee Heaton and is hosted by New York Giants’ player, Dancing With The Stars champion, and best-selling author Rashad Jennings. Above the bustling streets of Times Square, celebrities are taking over the Marriott Marquis’ iconic sky-high lounge and rooftop and bringing you an amenity-packed party with a live concert that New York City is buzzing about. NYC’s Page Six has also clocked the event, citing the “luxury” experience and the concert’s impressive line-up. The Marriott Marquis’ Broadway Lounge has unparalleled views of New York City and the Waterford Crystal Ball drop. Broadcasted around the globe annually, the Times Square Ball drop is a world-wide phenomenon and you’ll be looking down on it all this year in this grand indoor/outdoor space. Above the bustling streets, we’re taking over the Marriott Marquis’ iconic penthouse and bringing you an amenity-packed party with a five hour premium open bar This New Year’s Eve. A live DJ will ignite the rooftop with a stellar playlist of the year’s best Top 40, house, and hip hop hits. With passed appetizers and specialty cocktails, soak in 360 degree views of New York City’s glittering skyline from a luxurious lounge. Follow that up with a luxury dinner and dessert buffet, compliments of Marriott’s executive chef. Two outdoor patios overlook Times Square as the big moment happens and as the clock strikes twelve you’ll be clinking complimentary glasses of champagne with pals and toasting to the New Year. Pick up a VIP package to take the night to the next level with reserved seating and bottle service. The Broadway Lounge is on the 8th and 9th floors of the Marriott, and the luxurious space is made to entertain. Glass walls on the outdoor patio provide an unobstructed view of the city while the full stocked indoor bar sits below high ceilings and dangling crystal globes. The sprawling space is decked out in contemporary décor, multiple flatscreens, and colorful illuminating tables. This exclusive NYE extravaganza is reserved for ticketholders, and sales have opened for the sparkling event. Enjoy New Year’s Eve in the hub of it all for an unparalleled event hosted by Rashad Jennings and watch Robin Thicke in concert at Marriott Marquis’ Broadway Lounge.